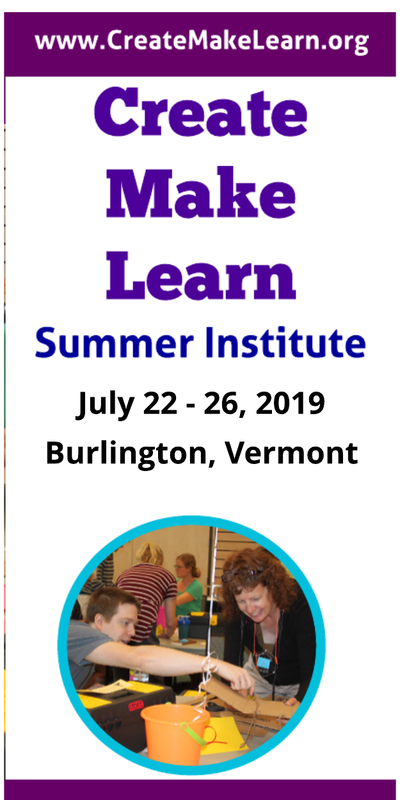 I love seeing how making happens in schools all over Vermont and beyond. 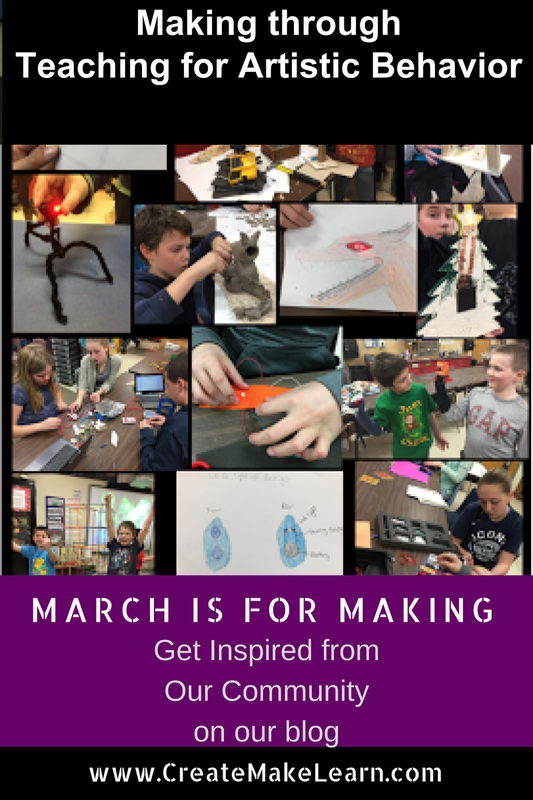 At Waits River Valley School, MAKING is a perfect fit for April Hallock's art studio where she teaches for artistic behavior (TAB). Her young artists experience not only have choice for their own project, but they also support each others' learning and making. As today's guest blogger, April Hallock shows and tells us what this looks like. Greetings from the makers at the Waits River Valley School Art Studio! From building structures with wood in the wood center to figuring out how a Makey Makey works, makers from kindergarten through eighth grade are busy generating ideas, experimenting with a variety of media, prototyping, and completing marvelous works of art based on their own personal investigations and curiosities. I teach for artistic behavior (TAB) and most of the time, our young artists experience having full choice to create their own projects. When students arrive for their class, I give a brief demo of a process, introduce a concept, or feature an artist from art history. Our makers may then choose to try the demonstrated process, express their reaction to the concept, or replicate art created by a famous artist or art movement. Many children enter the art studio with plans they have developed outside of the art studio or they bring art to work on that they have started in their own studios at home. 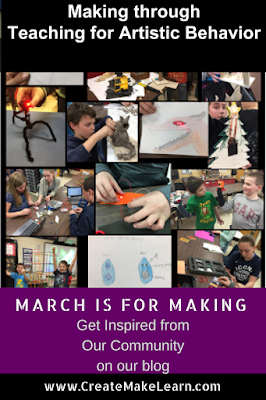 Students may choose from centers which include (but are not limited to): Drawing, Painting, Collage, Sculpture, Printmaking, Mask-making, and Clay. Today, during the second grade class, one student lead half of the class in a pop-up puppet-making extravaganza! Luckily, I had plenty of socks that had been donated for just this purpose. When teaching for artistic behavior, I feel as though I have to be ready for practically anything! When I attended the Create Make Learn Institute last summer, I met Jill Dawson, a remarkable lady who changed my understanding and appreciation for all things that light up and blink. Check out her blog: here. 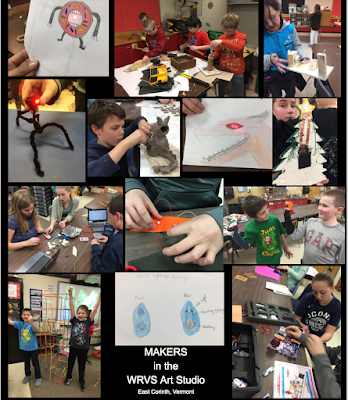 So, last trimester, I facilitated an elective designed for the middle school which focused primarily on circuitry, coding, and integrating these areas within the realm of art. Makers in sixth through eighth grade learned how to make simple and parallel circuits using Chibitronics tutorials. Projects included lighting up the mouths and eyes of student-designed characters in both 2d and 3d works of art. Wearable electronics included several bracelets and even a pair of LED earrings. We played with Makey Makeys, explored snap circuits, and completed an Hour of Code. During this third trimester, the music teacher, librarian, and I have prepared electives for the scholars in middle school based on Shakespeare’s comedy: A Midsummer Night’s Dream. Students will be able to choose whether they would like to focus the trimester on acting, set-costume-and-lighting design, and the musical aspects of the show. Our performance will be presented in the woods (we have 40 acres to choose from!) so students who choose to work in the art studio may be carpenters building outdoor seating (with money from the CLiF grant), sewing lots and lots of fairy wings with twinkly lights, making props, constructing Bottom’s head, preparing the set, running the lights, etc. So, this is how making in my school works. It’s crazy-busy for me but I love it and the kids love it, too. When I changed from a discipline-based art teacher (where I developed all of the projects for the kids) to a TAB teacher, it was scary because I felt like I was giving up a lot of my control. I did (and still do) soooooo much research on how to facilitate an art studio with children as the center, children as the makers, and I’m still learning. For the most part, students know what the expectations are in the art studio and for the most part, wonderfully amazing magic occurs every day in the art studio! 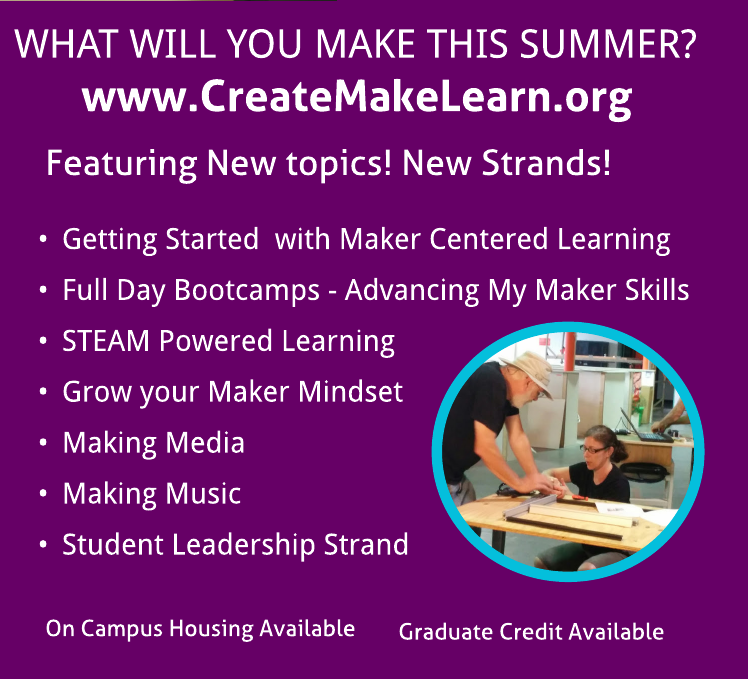 I have known in my heart that TAB and a makerspace environment is what is good for children; it is empowering for them because they can fail and it’s ok because they have time to learn from their mistakes and can begin to learn to perseverance. With persistence, a willingness to take risks, and a desire to learn, one can do anything. But one needs to practice these behaviors in order to gain confidence in this design thinking process. I am SO VERY LUCKY to be able to offer kids an opportunity to create and make and learn.